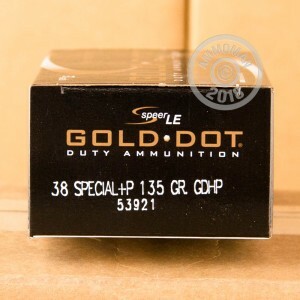 Load up your pistol and protect yourself with 38 Special +P Speer Gold Dot ammunition. This Jacketed Hollow Point ammo dominates in the law enforcement profession, making it an ideal candidate for your personal protection needs. Speer Gold Dot cartridges excel in the handgun ammunition tests developed by the FBI for service-class handgun cartridges. These tests evaluate total penetration and expansion. The results for this ammunition show optimum penetration and expansion through gelatin when fired from a 2-inch revolver. The Boxer-primed and nickel-plated brass cased load features a 135 grain Jacketed Hollow Point bullet. Jacketed Hollow Points are designed to expand rapidly upon reaching their target, thus the attacker absorbs much more of the bullet's kinetic energy. They are also safer for innocent bystanders as they will not exit the body and injure someone else. Speer offers some of the best law enforcement, personal protection, handgun hunting and training ammunition on the market. You can feel confident that you're buying top of the line ammo with Speer. 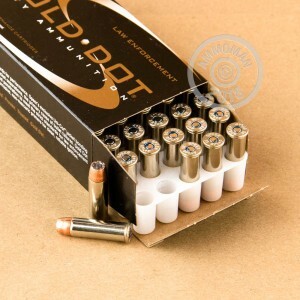 Save money when you buy this bulk quantity of 1,000 Rounds today!